At the 2012 NAMM Show in Anaheim/USA, Shure introduced its ULX-D Digital Wireless System which was also showcased at Prolight + Sound show 2012 in Frankfurt, Germany. ULX-D provides pure wireless sound reproduction combined with spectrum-efficient RF performance meeting the needs of demanding installed applications. ULX-D employs the Advanced Encryption Standard (AES-256), allows for a seamless integration in current media control systems, and utilizes latest rechargeability technology, originating from Axient, Shure’s premium Wireless Management Network. ULX-D allows up to 17 active transmitters on an 8 MHz TV channel and over 60 compatible channels in one frequency band with permanent signal stability over the entire 100 meter line-of-sight range. Adapted from the premium Shure Axient Wireless Management Network, ULX-D offers advanced and efficient rechargeability. The Shure SB900 is a smart, rechargeable Li-Ion battery guaranteeing full capacity within three hours and up to 12 hours of continuous use, with precision tracking of battery life, battery health and charge cycle details. For all installation environments where secure transmission is key, ULX-D for unbreachable privacy. As ease-of-use is an overriding requirement, the half-rack, networkable receiver uses intelligent scanning which automatically finds and deploys the cleanest frequencies to transmitters over infrared synchronization. 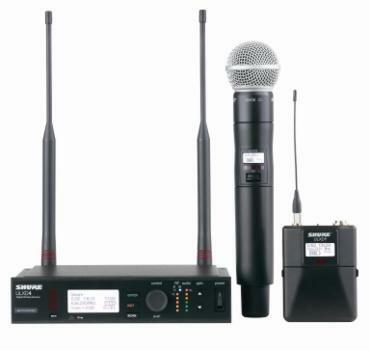 Its Ethernet networking enables the integration of Shure’s Wireless Workbench 6 software (WWB6) as well as the frequency coordination with the Axient Spectrum Manager. Furthermore ULX-D supports the use of current media control systems from AMX or Crestron.